This week will get everyone bankrupt because of the following sales!!! 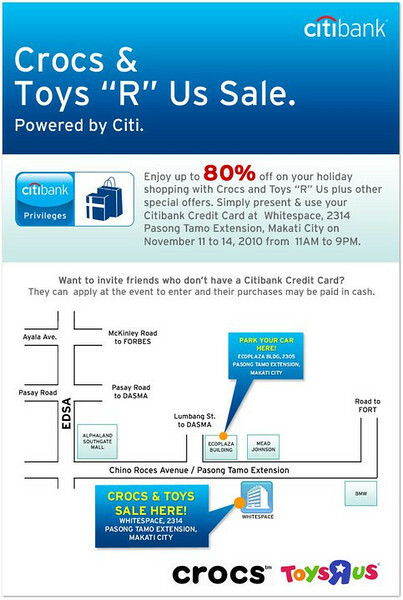 First, there's the Crocs and Toys "R" Us sale at Whitespace this Nov 11-14, 2010!!! Another great sale is the much awaited Gingersnaps and Just G warehouse sale is on again at Warehouse 19 Armal Compound 2, M. Eusebio Ave., Pasig City. Mondays-Saturdays, except Holidays, Sundays and Extreme Weather Conditions, 8:00am to 4:00pm. 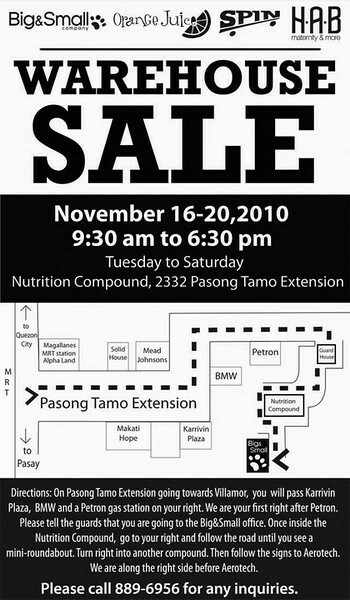 From Nov. 12 to Dec. 29, 2010. Lots of great value for your money! Cash basis only. Per DTI-NCR Permit No. 5637/5639 series of 2010. And don't forget, the Richwell Sale is also ongoing!!! Organize your shopping list, dear readers, so you don't go overboard.